I suppose we could call this one a Throwback Thursday, couldn’t we? Because this happened almost exactly one year ago, though I never did a race report. I’m a bit out of practice, but here goes nothing. The morning dawned bright and muggy. Each year for over 10 years now, my wife’s parents rent a beach house at some very nice location for their vacation. What has always happened is that they would rent a house big enough for all of their kids and their families, and then they would invite everyone. Come, don’t come, that doesn’t matter – you are all invited. July of 2015 will be the 8th year I’ve been in the family for this, and it was a long-established tradition before I got there. They started in the Sandbridge area of Virginia Beach, Virginia. That’s where my first year was. But my first year in Sandbridge was the family’s last year in Sandbridge – the drive from northern New Jersey was proving too much. So we gradually began migrating up the coast. The following year was in Cape May, New Jersey. The year after that began a two-year run in Mantaloking, New Jersey. And then there were three years in Southampton, New York, on Long Island. By this point in the summer of 2014, I was basically not running anymore but had not yet given up on the idea of me running. And one of my sisters-in-law is very athletic and saw this 5k and sent out a blast to the family – I want to run it, lets have a bunch of us do that. So I signed up. There was some confusion at the bib pickup, and I knew there would be – when I signed up online, there was never an option to pay. So when I showed up at the race, they said “You’re the guy that didn’t pay!” But, because I was expecting that I was prepared with cash and we didn’t have a problem. 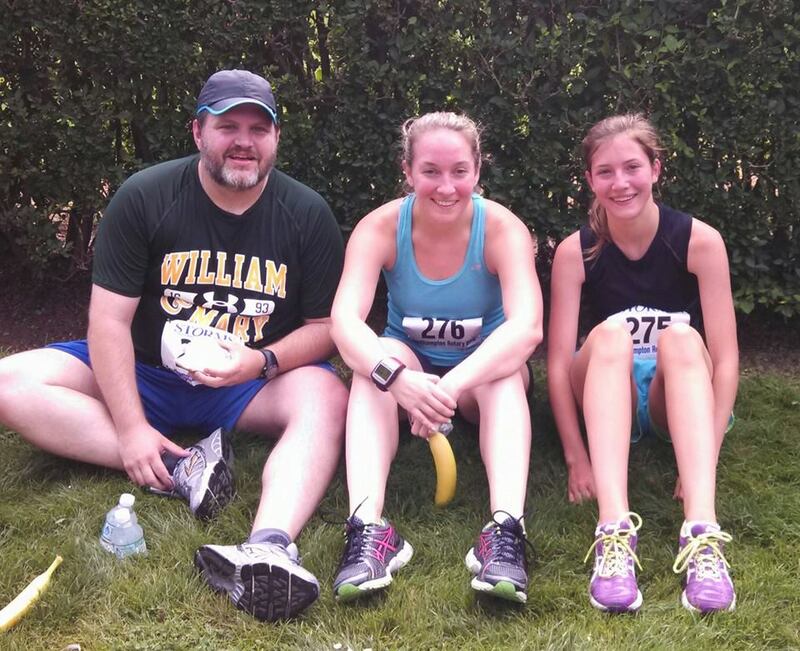 It turned out that the only family members that actually were running the race were the aforementioned sister-in-law, my niece who is in high school and runs cross country, and me. I made it clear very early on that my feelings would not be hurt when they left me in the dust. We got there pretty early, so we spent 30 minutes warming up by jogging around the little park where the start line was. And then we lined up and were off. We ran down about 200 yards, turned left and climbed the only real hill of the race, and then ran a big square in a neighborhood area full of $1million+ homes in the Hamptons. We then came back down the hill and headed back to the finish line. So, yeah, I was unprepared for this race. Things went OK until I got maybe a quarter mile past the top of the hill, and then my right shin seized up and that was it. I run / walked the rest of the way in pain, wondering what in the hell my shins had against me. Seriously – that’s worth your time. 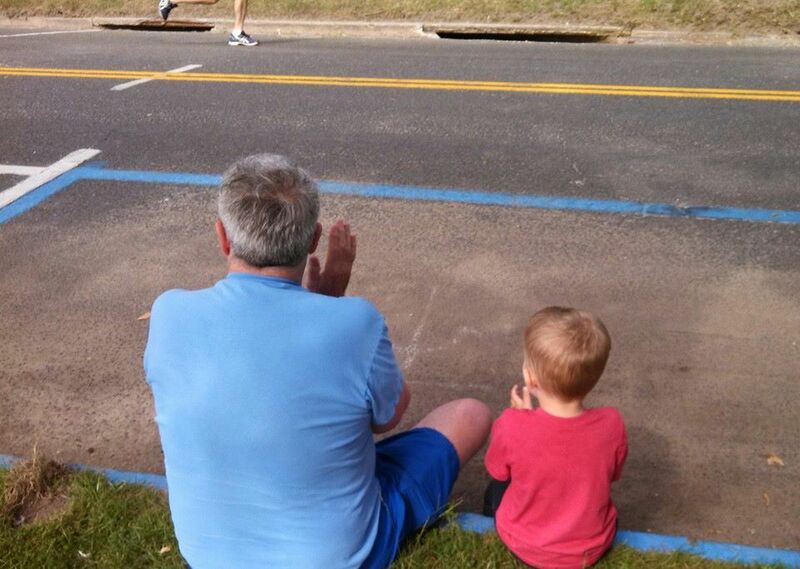 That’s my son on the left – I love it when he gets to come out and see me doing this. My time was horrible – 38 minutes and 23 seconds. That is slower than my first ever 5K. I was so discouraged that this performance basically ended my running for the next six months – my last run was on August 3rd, with a little attempt in February 2015 and then a couple of fits and starts in May / June. – Hard to say it more strongly – that really really sucked. – Having a cheering section like that, though, is amazing. Seriously, amazing. – Running in the Hamptons is a bit surreal, if you want to know the truth. The houses we were running past were protected by huge hedges, so mostly we were running through a big green tunnel. And then when you did see a house, it was a freaking mansion. Weird. – My sister-in-law and my niece both did run away from me – they had a decent race. I was happy for them, even if I was disappointed in myself. – I don’t remember much about the SWAG. The t-shirt was a cotton job that my wife wears all of the time around the house. And the bib was a unique one that said Southampton Rotary Club, which I love. The spread at the end was bagels and bananas, and there were plenty left when a back-of-the-packer like me made it to the table. – That race was the 17th and last race of my streak. In January of 2013, I weighed about 315 pounds. In March of 2014, I ran my first 5K, and then ran at least one event in 16 straight months, losing 50 pounds in the process and feeling amazing. During the streak I ran a Ragnar, two half marathons, a 15k, two 10ks, a 5-miler, ten 5ks, and a 4k. I ran events in 6 states and the District of Columbia. I ran through three pairs of shoes, and just basically felt like a million damn dollars. – I want that back. I want it back badly.